With 4,968 runs in 60 Test matches, Azhar Ali will soon become the 8th batsman from Pakistan to score 5,000 Test runs. Misbah Ul Haq was the last entry into this club during the recently concluded series against the West Indies. Since his debut in the summer of 2010, Azhar Ali has risen to become one of Pakistan's key test batsmen. He has scored runs in all conditions, has been a mainstay at number 3 for Pakistan, and in more recent times has been one of Pakistan's most effective Test openers ever. Since his debut, Azhar Ali is Pakistan's leading run scorer in Tests. He out scored Younis Khan and Misbah Ul Haq during this period; the two great pillars of Pakistan's test team. 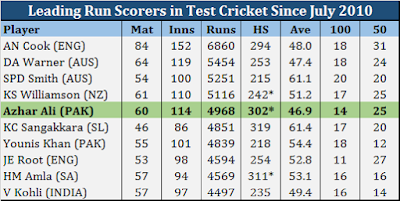 Among all Test batsmen during this period, Azhar Ali has the 5th highest runs tally. And third highest among openers, behind only Alastair Cook and David Warner. In terms of his Test average, Azhar is at par with both Cook and Warner. Given this, it quite surprises me that there is no mention of Azhar Ali when the world's best - Joe Root, Steve Smith, Virat Kohli - are talked about. That could very possibly be because of his lack of success in other formats of the game. Rather, not the same level of success he has had in Test cricket. No doubt Azhar Ali's batting suits Test cricket more, but his ODI record is also quite neat. For majority of his career thus far, Azhar Ali batted at number 3 for Pakistan; however over the past two seasons he has been opening. It in this position, where he has truly blossomed into a world class performer. His record as an opener for Pakistan in Tests is unparalleled. In fact, it is one of the best records for an opener in Test cricket. 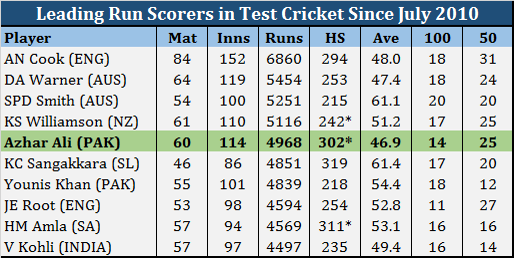 Azhar's current Test average as an opener is the 6th highest average among all batsmen who have opened in at least 20 innings in Tests in the history of the game. There is no one in that table from this era, besides Matthew Hayden. All those other batsmen played cricket a long long time ago. Azhar has had a phenomenal two years as an opener in Test cricket, better than any opener has had for Pakistan ever. He might end up moving back to number 3 now that Younis and Misbah have retired, but I would really be tempted to make him keep opening for the rest of his career, given his unprecedented record so far. Whether number 3 or opener though, I have no doubt that Azhar Ali is among the best in the world right now and he will end is career as a Test great and quite possibly as only the second batsman from Pakistan to cross 10,000 Test runs. Monday, May 22, 2017 This comment has been removed by a blog administrator. Thursday, June 01, 2017 This comment has been removed by a blog administrator.